Hi, we are Andrew Taylor from Taylor Newberry Consulting and Ben Liadsky from the Ontario Nonprofit Network. Back in February, we blogged on AEA365 about our work to build an evaluation agenda for the nonprofit sector and we were thrilled to be able to attend the recent AEA conference in Atlanta to present our work as well as to learn from others. As we pointed out in our first AEA365 blog, when an evaluation is required by a funder as a means of proving accountability, it is less likely to prove useful to nonprofits or to funders. In particular, funder-mandated evaluation seems to be most frustrating when the conversation begins with a discussion of how to evaluate, without first making time for the development of a common understanding of why an evaluation would be helpful or meaningful. 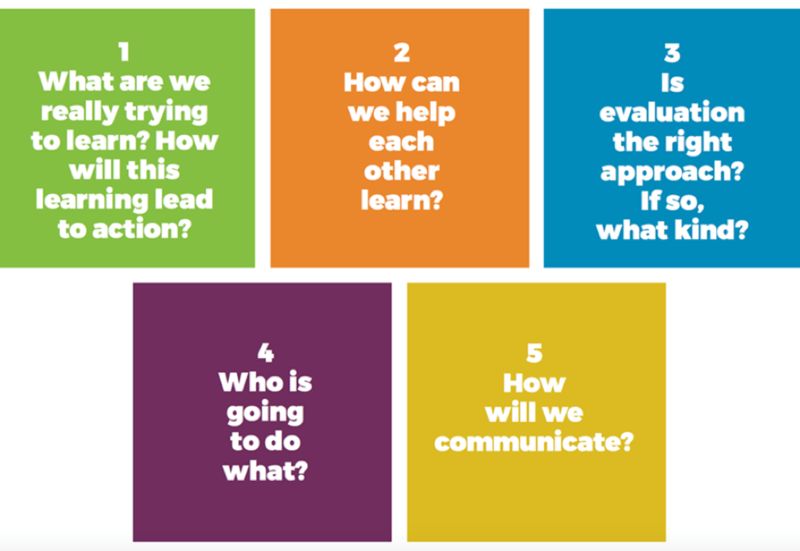 Learning Together: Five Important Discussion Questions to Make Evaluation Useful is the result of many conversations we’ve had with both nonprofits and funders across Ontario. The guide is meant to help nonprofits (as well as funders and other stakeholders) to articulate more clearly what they want to get out of an evaluation and what concerns they may have about the process — regardless of the size, mission, or location of the organization. It’s a conversation starter and a means to open a dialogue with stakeholders in a subject area that can be complex and difficult. The guide offers several suggestions about how to frame each of the five questions along with tips about when and where to ask each question. It reviews the challenges that can come up when discussing each question and offers ideas about how to handle them. Fundamentally, the guide is intended to help put the question of why back in the forefront of evaluation design. Changing evaluation practices in the nonprofit sector won’t be easy. It will take time and effort. Yet, nonprofits should be helping to set the evaluation agenda, not acting as mere bystanders in the process. Talking with one another about the purpose of evaluation and the problems that get in the way of fulfilling that purpose is a good place to start.